For decades the Woodmen of the World Hall served as a central gathering place for the community. The original building was a single-story, 25 by 60 foot structure built in 1897 by the popular turn-of-the-century fraternal organization. In 1901 contractor Marshall (Mont) Fulford added a second story and remodeled the lower floors to add glass windows suitable for a storefront. T.A. 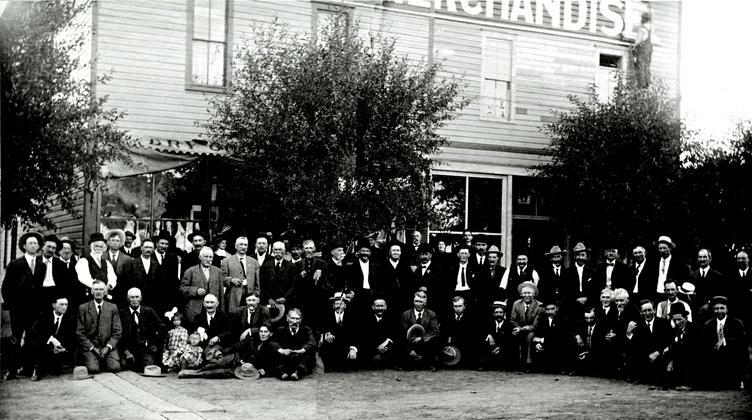 Howes opened a dry goods store at that time. The upstairs lodge room was used for public entertainment including dances, shows, school programs and sports. The room had a 15-foot high ceiling and was used for many years as a basketball court by the Eagle High School team. At times the upstairs space was also a place of culture, serving as the “Eagle Opera House” in 1913 and as a movie theater. When Eagle became the County Seat in 1921, the county offices were moved from Red Cliff into this building until the new courthouse was built in 1933. During the 1920s, Eagle’s firefighting equipment – a hose cart – was stored in the back of the building. In 1938, the building was renovated, adding space at the back. The downstairs was changed into a modern movie theater with a sloping floor, fixed seating and a center aisle. The movie theater operated until 1972. The building also featured two apartments and a doctor’s office suite above. The original building was “deconstructed” in 2007 so the current structure could be built. Some of the old materials, such as the oak flooring from upstairs, were incorporated into this new building.